Doctor Who: Revisiting ARMY OF GHOSTS / DOOMSDAY | Warped Factor - Words in the Key of Geek. Series 2 of Doctor Who was full of gambles. It opened with the first reboot, the Troughton Test of whether the viewers won over by the Eccleston-Piper mix would buy into the idea of regeneration, and whether the chemistry between the two could ever be maintained. It was set to end with a test of the other half of the dynamic – Rose Tyler had been with us from the very beginning of New Who, she’d been our window into the Time Lord’s world and for the Doctor himself, she’d proved to be a reminder of his life and values before the Daleks took everything mad and fun and dilettante away from his life in the last great time war. In the Eccleston incarnation, she’d found a way to be better than his inclination and experiences had left him, and shown him the way back to himself as he used to be. 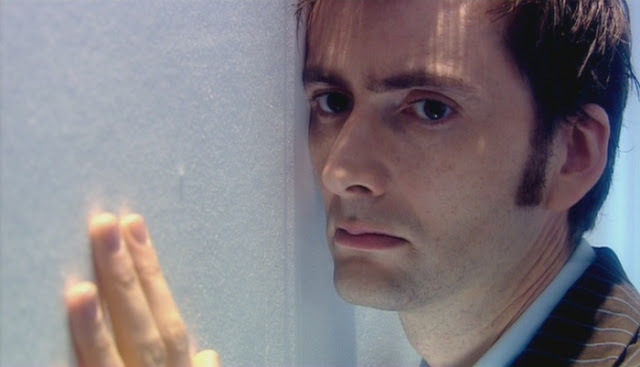 In his first season, David Tennant’s Tenth Doctor had taken that and made it dangerously accessible to her as an Earthling, the idea of them being more than Time Lord and companion, of them perhaps being the kind of love she’d understand between them raising its head more than once. It would be overstating the case massively to say that was all about to change with the leaving of Billie Piper and the theoretical ‘last chapter’ of the Tyler family saga. But there had to be a build-up to an ending that could serve as that last chapter and satisfy the new viewers who had been won over to Doctor Who precisely because of the new human factor. Army of Ghosts and Doomsday also had to pay off the growing Torchwood theme that had been seeded throughout Series 2 in the same way as the Bad Wolf theme had been seeded through Series 1. So – not much to do then. But it also had to be compelling Doctor Who in its own right, with the kind of scope that a series finale demanded. Series 1 had ended with a massive Dalek fleet, a giant Dalek emperor, a Deus Ex Machina twist, a kiss between the Doctor and Rose and a regeneration. How do you top that? You let your inner fanboy off the leash, and, in a move borrowed from the less successful Hollywood superhero sequels (or indeed the imagination of every action figuring child), you smash the show’s greatest enemies together for the first time in on-screen history. Looking back from ten years on, it’s easy to be blasé about Army of Ghosts and Doomsday, but to get the most from any rewatch, you have to watch it as a child of 2006, because then the treats it delivers really tingle, and the emotional punches land more heavily. But before all the treats, there’s a classic Davies trick – a sombre tone at the start of each episode, and promises that Rose Tyler dies by the end of the story. That initial revelation acts as a counterweight to all the dashing about and madness in at least Army of Ghosts and makes you always expect a final twist. Because even after his encounter with The Beast, that’s what the Doctor does – he brings science and reason to a universe too eager to assuage its pain by believing in the supernatural. The ghosts, right from the start, give a hint of what they are, and running parallel to the Doctor and Rose finding out about the ghosts, we are quickly bedded into the culture of Torchwood under Yvonne Hartman, the proto-Imperialist with people skills. Torchwood is clearly responsible for the ‘ghost shifts’ – there are classic big science-fiction levers and everything – but it doesn’t take long before Torchwood operative Adeola (Freema Agyeman) is running into Cybermen and getting earpodded to zombie-death, rather lessening the tension about what the ghosts actually will turn out to be. Not so the giant sphere which turns out to be a void-ship, and which gives the inner eight year-old in all Who-fans plenty of reasons to jump up and down at the end of Army of Ghosts. The creation of the double threat – armies of Cybermen, upping the ante on Rise of the Cybermen and The Age of Steel and marching all over the world is still a breathtaking sight if you let it be, and the very nature of a Cyber-invasion so simply achieved has a degree of classic sci-fi warning about it: taking the easiest and most comfortable explanation of the world seldom leads to happy outcomes. 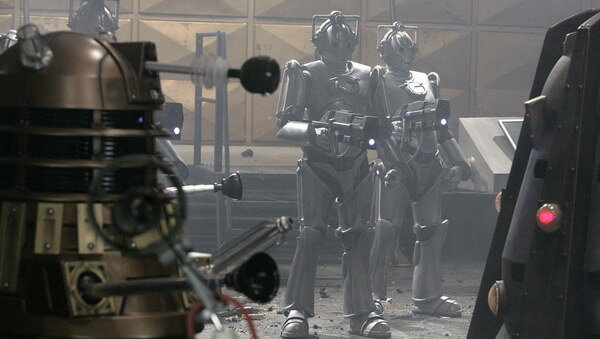 The arrival of the Daleks adds a core of dark grit in the middle of the storytelling arc, too – yes, yes, the Cybermen now rule the planet, but the signature encounter between the Daleks and the Cybermen is actually quite funny – the Cybermen, logically, proposing an alliance, the Daleks exterminating them, with the line that this is not war, this is ‘pest control.’ Deliciously, the Daleks immediately judge the ‘Cyberman threat irrelevant,’ staking their claim to the top spot of universal villainy. The toing and froing between dimensions is mostly filler, but important filler, setting up an ending that needs to be there to serve the storytelling demands of the soap-fans. Meanwhile Davies invents plot elements with brio. The Cult of Skaro’s a new development: Daleks that can think like the enemy. Daleks with enough personality to have names – another nod to the old comic-book stories. We see the Dalek’s sucker-arm deployed as an offensive weapon for the first time (so there, Bill!). The Cybermen get more fleshing out than they did in Rise of the Cybermen and The Age of Steel, and begin to feel like a species in control of their own destiny and their own philosophy – we get quite a long speech about why they do what they do in these episodes, a Cyber raison d’etre. The tension builds with the Genesis Ark sub-plot and when the numbers game changes in the Daleks’ favour, there’s a great sequence of the pepperpots of death exterminating everything in sight. That said, the solution to the Dalek and Cyber threats is very ‘reverse the polarity of the neutron flow,’ though the nail-biting question of whether Rose will go flying into the void with all the metal meanies still has some power today. And then there’s that ending. That tacked-on, sentimental but apparently necessary finale set in Bad Wolf Bay, where the Doctor burns up a supernova to learn the lesson of Sarah-Jane and say a proper goodbye. 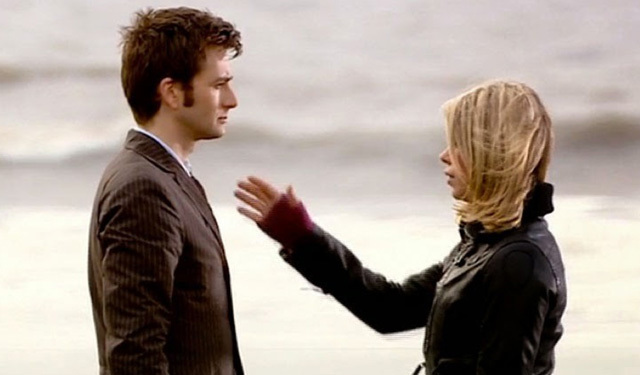 Rose Tyler finally says the words she’s longed to say, the very human ‘I love you,’ and the Doctor misses his chance to reciprocate immediately, going for the gag with a ‘Quite right too.’ When he disappears before he says whatever he was going to say, it punches a nation of New Who fans right in the hearts, while quite a few Classic fans roll their eyes and tut at the mawkishness. The mark of the first Tennant season was energy, laughter, a well-hidden occasional darkness and that sentimental streak, the Tenth being a Doctor far more in touch with his humanised emotions than the Ninth had ever been. Catherine Tate though takes three sentences at the end of Doomsday to screen wipe the mawkishness and deliver an entirely different tone, a relationship that is instantly more spiky with the Tenth Doctor, promising good comedic chemistry at Christmas. 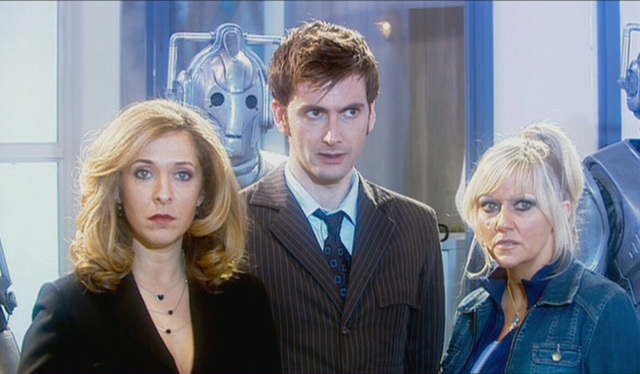 Watched on broadcast, Army of Ghosts and Doomsday delivered everything they had to – a wrap-up for the Tyler family, a (slightly damp squib) resolution for the Torchwood story-arc, an emotional punch to the end of the Rose Tyler-Tenth Doctor adventure and Daleks and Cybermen on the same screen, fighting for dominion over the Earth. Rewatched ten years on, and divorced from the episodic involvement in the Doctor and Rose saga, the episodes together feel more like a ‘young viewer’ story, a technicolour monster romp with some romantic goo dripped through it to appeal to the newbies. It will always repay watching for the Daleks and the Cybermen, but beyond that, it’s more forgettable than all involved would have wished.